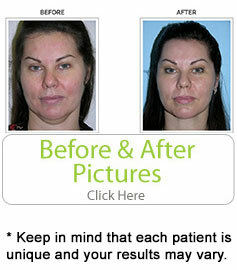 The Thermage procedure was developed to help the signs of aging skin. It works by tightening tissues. The Thermage procedure is also known as ThermaLift, Thermal Lifting, Therma Plasty, and Thermoplastic contouring. The Thermage technology is being studied for other aesthetic uses on the face and body. How does it work? The radiofrequency (RF) energy uniformly heats the dermis while cooling and protecting the epidermis. It is designed to cause immediate collagen contraction followed by new collagen production which occurs over a period of time. The Thermage procedure is the only non-invasive method to tighten loose skin. Each time the treatment is delivered there is an immediate cool sensation, followed by a brief hot sensation, followed by a cool sensation. Your physician may offer additional measures to increase your comfort. Depending on the size of the area treated, the procedure itself may take anywhere from a few minutes to an hour. You may return to your normal activities immediately, as there is usually no “downtime”. Minimal redness is seen in some patients but it usually disappears shortly after treatment. Heat-related complications can occur but are uncommon. There is no special care needed after treatment. As a part of good skin care, sunscreen is recommended. In most patients, results appear gradually over 2-6 months, although some patients see an earlier response. How many treatments will I need? A single treatment has produced good results in a significant number of patients. However, your doctor will assess the number and frequency of treatments required to achieve optimal results for your skin. Four months after the Thermage Procedure there is new and denser collagen and an appreciable increase in the thickness of the epidermis. For more information or to schedule a complimentary consultation, feel free to call us at 305-270-1361 by phone or email us today. Let Dr. Salomon help you achieve the self-image you desire.